The Palm Coaster , Spring 1984, pp. 16-17. Lehigh Industrial Site offering Intracoastal Waterway access ! How fortunate we are to have that acreage available for Marine, Water, Ecology minded Businesses ! To our knowledge I.T.T. donated to us all that massive acreage. 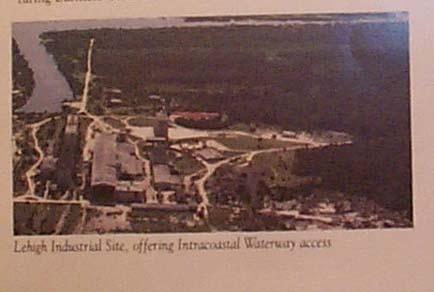 Lehigh Industrial Site, offering Intracoastal Waterway access. 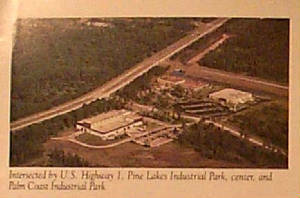 Pine Lakes Industrial Park: a 70 acre prestige part bordered by U.S. Highway 1, Berke Parkway and St. Joe Road. Current Tenants: The Wittemann Company, Inc. ( 61,000 sq ft. headquarters and plant); Cardiac Control Systems, Ind., ( 30,000 sq foot facility) and Racal Decca marine ( 33,000 sq foot facility) Still available are sites ranging from 3,65 acres to 5 acres or combinations thereof. 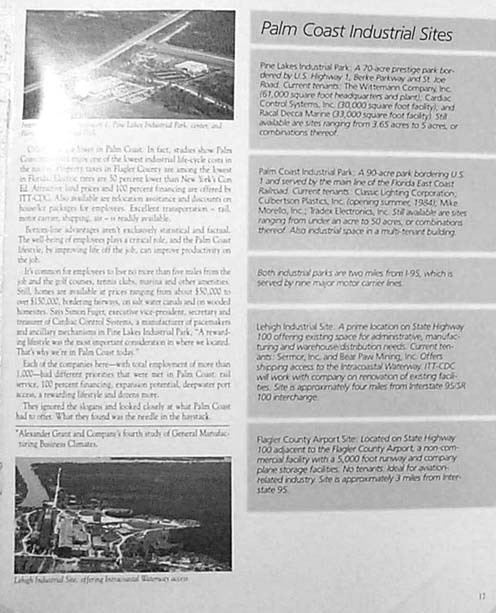 Palm Coast Industrial Park: A 90 acre park bordering U.S. 1 and served by the main line of the Florida East Coast Railroad. Current tenants: Classic Lighting Corporation, Culbertson Plastics, Inc. ( opening summer, 1984), Mike Morello, Inc. Tradex Electronics, Inc. Still available are sites ranging from under an acre to 50 acres, or combinations thereof. Also industrial space in a multi-tenant building. Both Industrial parks are two miles from I-95 which is served by nine major motor carrier lines. Lehigh Industrial Site: A prime location on State Highway 100 offering existing space for administrative, manufacturing and warehouse distribution needs. Current tenants: Semor, Inc. and Bear Paw Mining, Inc. Offers shipping access to the Intracoastal Waterway. ITT-CDC will work with the company on renovation of existing facilities. Site is approximately four miles from Interstate 95/S.R. 1000 interchange. Flagler County Airport Site: Located on State Highway 100 adjacent to the Flagler County Airport, a non-commercial facility with a 5,000 foot runway and company place storage favilities. No tenants, ideal for aviation-related industry. Site is approximately 3 miles from Interstate 95. The Palm Coaster, Spring 1984, p. 17. Other costs are lower in Palm Coast. In fact, studies show Palm Coast industries enjoy one of the lowest industrial life-=style costs in the nation. Property taxes in Flagler County are among the lowest in Florida. Electric rates are 50 percent lower than New York's Con Ed. Attractive land prices and 100 percent financing are offered by ITT-CDC. Also available are relocation assistance and discounts on house/lot packages for employees. Excellent transportation - rail, motor carries, shipping, air - is readily available. Common line advantages aren't exclusively statistical and factual. The well-being of employees plays a critical role, and the Palm Coast lifestyle, by improving life off the job, can improve productivity on the job. It's common for employees to live no more than five miles fro the job and the golf courses, tennis clubs, marina and other amenities. Still, homes are available at prices ranging from about $ 50,000. to over $ 150,000., bordering fairways, on salt water canals and on wooded homesites. Says Simon Fuger, executive vice-president, secretary and treasurer of Cardiac Control Systems, a manufactures of pacemakers and ancillary mechanisms in Pine Lakes Industrial Park, " A rewarding lifestyle was the most important consideration in where we located. That's why we're in Palm Coast today." Each of the companies here, with total employment of more than 1,000 - had different priorities that were met in Palm Coast: rail service, 100 percent financing, expansion potential, deepwater port access, a rewarding lifestyle and dozens more. They ignored the slogans and looked closely at what Palm Coast had to offer. What they found was the needle in the haystack. * Alexander Grand and Company's fourth study of General Manufacturing Business Climates. Which Business Building was Federally Ordered...? Intersected by U.S. Highway 1, Pine Lakes Industrial Park, center, and Palm Coast Industrial Park. 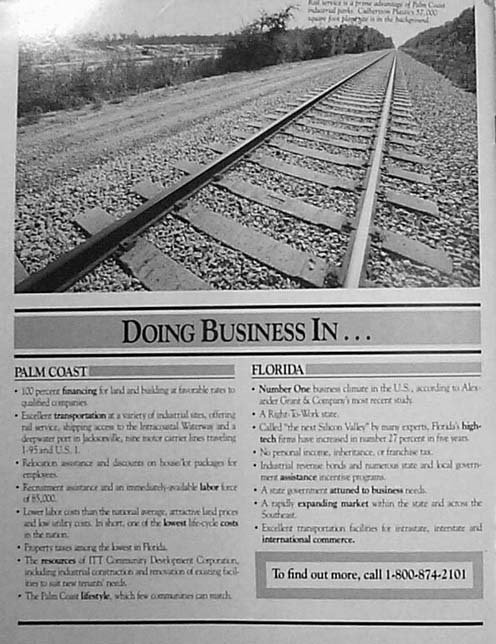 Rail service is a prime advantage of Palm Coast industrial parks. Culbertson Plastics 57,000 square foot plant site is in the background. 100 percent financing for land and building at favorable rates to qualified companies. Excellent transportation at a variety of industrial sites, offering rail service, shipping access to the Intracoastal Waterway , and a deepwater port in Jacksonville, nine motor carrier lines traveling I-95 and U.S. 1. Relocation assistance and discounts on house/lot packages for employees. Recruitment assistance and an immediately available labor force of 85,000. Lower labor costs than the national average, attractive land prices and low utility costs. In short, one of the lowest life cycle costs in the nation. Property taxes among the lowest in Florida. The resources if ITT Community Development Corporation, including industrial construction and renovation of existing facilities to suit new tenants' needs. The Palm Coast lifestyle, which few communities can match. Number one business climate in the U.S., according to Alexander Grant and Company's most recent study. Called "the next Silicon Valley" by many experts, Florida's high tech firms have increased in number 27 percent in five years. No personal income, inheritance, or franchise tax. Industrial revenue bonds and numerous state and local government assistance incentive programs. A state government attuned to business needs. A rapidly expanding market within the state and across the Southeast. Excellent transportation facilities for intrastate, interstate and international commerce. 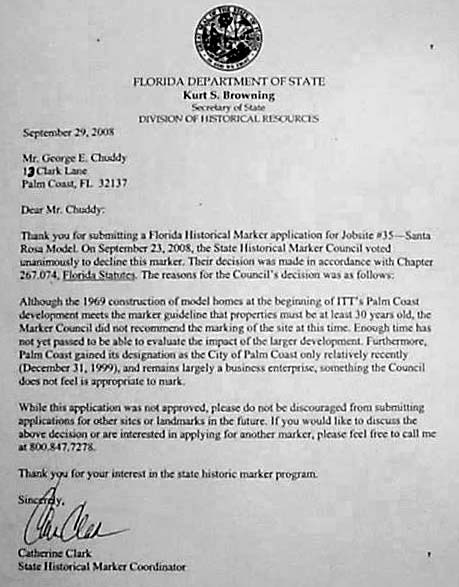 We will remain Stewards of these Heritage and Historic Resources hoping for a Certified Local Government like so many other Florida Leadership Cities alreay are; hoping for a Museum like Flagler Beach already has.